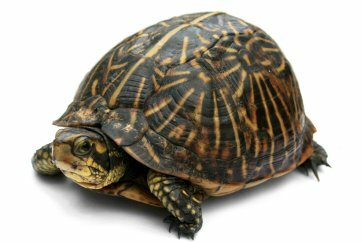 The Spotted Turtle is considered semi-aquatic as it spends less time in the water than other turtles. 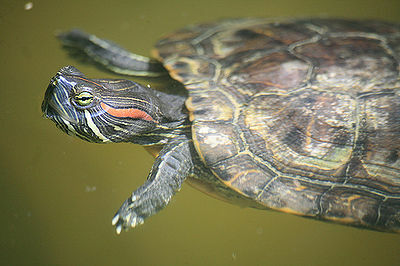 As Adults, the spotted turtle is small, measuring 4-6 inches long. It is long-lived, reaching over 100 years. 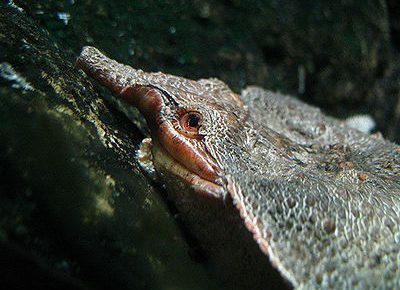 The feet are not as webbed as other turtles nor do they swim as well. But this turtle does need a big tank that provides diving and swimming space. The water should be no more than 6 inches deep. It should be set up so the turtle can easily climb out of the water and have places for basking and drying off. A basking light is needed. Water temperature should be 70-75 degrees while basking area should be 90 degrees. Use heat lights and a water heater to keep temperature constant and avoid illness. Air pumps can be added to oxygenate the water. Tap water can be used with a dechlorination product from the pet shop. Let it stand 24 hours before adding to the tank. The spotted turtle diet includes turtle pellets as well as fresh greens and insects purchased a the pet shop. It’s a good idea to have your pet checked annually by an exotic vet to help maintain good health.